Frame Destination Inc. of Dallas, TX announces two new cases designed to help protect the Apple iPad and related accessories. April 16, 2010 - PRLog -- Frame Destination Inc. announces the 8x10 GalleryPouch™ Gold w/ Velcro® iPad Case and the 9x11 GalleryPouch™ Gold w/ Velcro® iPad Case, two new bubble bag cases that can help protect the Apple iPad and its accessories. Like all GalleryPouch™ Gold premium bubble bags, GalleryPouch™ Gold w/ Velcro® iPad Cases are made from transparent, heavyweight laminated bubble material that is very difficult to pop. Both sides of the product are smooth, making it easy to slip in the Apple iPad or iPad accessories and carry it around in a bag, backpack, pocketbook, laptop case or other type of bag. They have an adjustable self-adhesive Velcro® sealing option that allows the customer to custom-tailor the size of the case, reducing slippage of the product when in transit. Simply remove the adhesive backing from the Velcro® strip after placing artwork or item in the case, and then adhere the Velcro® to the front of the case. GalleryPouch™ Gold w/ Velcro® iPad Cases were developed by photographer and author Andrew Darlow and Mark Rogers, founder and President of Frame Destination. Darlow says: "The Apple iPad is a fantastic device that can go almost anywhere with you. But I quickly realized after using an iPad for just a short time how difficult it was to keep it protected when not in use. While testing out the Apple iPad Case, I noticed that dust and other debris could easily enter the case when placed on a desk or in a bag. The GalleryPouch™ Gold w/ Velcro® iPad Cases greatly reduce these problems by helping keep the iPad protected, while allowing the user to customize the exact size of the case just by adjusting the placement of the Velcro®." 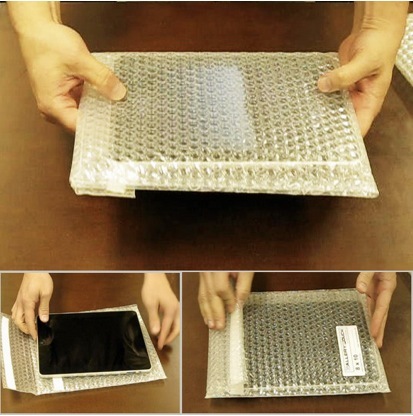 Mark Rogers adds: ”So many of our customers rely on their electronic equipment, so applying our experience in making custom and affordable protective bubble bags to help protect the Apple iPad and related accessories was a no-brainer. With so many other devices on the market, we also expect to see these new iPad cases being used for other products, such as the Amazon Kindle™, Sony Reader and Barnes and Noble nook™." The GalleryPouch™ iPad cases are available now for purchase to US-based addresses through the Frame Destination website (Visit http://www.GalleryPouch.com/ipad for info and details). The price of the 8x10 GalleryPouch™ Gold w/ Velcro® iPad Case is $7.95 (US) and the price of the 9x11 GalleryPouch™ Gold w/ Velcro® iPad Case is $8.95 (US). Two additional GalleryPouch™ Gold cases (6x9 inches and 9x13 inches in size), designed to help protect devices including GPS units, tablet computers, netbooks and other devices are also available on the website. The site also contains a wide range of other stock sizes, as well as custom sizes up to 50 x 156 inches. There is no minimum purchase and clients may request the bag opening to be on the long or short side. A dedicated website at http://www.gallerypouch.com contains instructional videos, tips, and FAQs. Customers are invited to ask questions and share photos, videos and stories about their experiences with the product. Frame Destination Inc. is a Dallas and Internet-based supplier of fine-art photography framing supplies. Mark Rogers is founder and president of the company, and operates the business online at http://www.framedestination.com. Andrew Darlow is a photographer, author and digital imaging consultant. He has lectured and conducted seminars and workshops around the world at photo-related conferences, and for photography organizations, including the Advertising Photographers of America (APA), The Center for Fine Art Photography, the Arles Photo Festival and the International Center of Photography (ICP).